Within the calendar year, there is another year: the great cycle of the liturgical year, revolving around the life and ministry Christ. Each season of the liturgical year has its own particular focus, feasts, words, and colors, giving us an opportunity to reflect on the meaning of the coming of Jesus, his life, and his commission to His people to be a light to the world. Since the 900s, Advent has marked the beginning of the church year, and is a season of great anticipation, preparation, and excitement, traditionally focusing on the Nativity of the Christ Child, when Jesus came as our Savior. During Advent, we as Christians also direct our thoughts to His second coming as judge. The word Advent is from the Latin adventus, meaning “coming,” and is celebrated during the four weeks of preparation for Christmas. Advent always contains four Sundays, beginning on the Sunday nearest the feast of St. Andrew the Apostle, (November 30) and continuing until December 24. It blends together a penitential spirit, very similar to Lent, a liturgical theme of preparation for the Second and Final Coming of the Lord, called the Parousia, and a joyful theme of getting ready for the Bethlehem event. Thus, Advent is far more than simply marking a 2,000 year old event in history. It is celebrating a truth about God, the revelation of God in Christ whereby all of creation might be reconciled to God. That is a process in which we participate, and the consummation of which we anticipate. Scripture readings for Advent reflect this emphasis on the Second Advent, including themes of accountability for faithfulness at His coming, judgment of sin, and the hope of eternal life. We celebrate with gladness the great promise of Advent, yet knowing that there is also a somber tone as the theme of final judgment is added to the theme of promise. This is reflected in some of the Scripture readings for Advent, in which there is a strong prophetic tone of accountability and judgment of sin. This is also faithful to the role of the Coming King who comes to rule, save, and judge, the world. Because of the dual themes of judgment and promise, Advent is a time of preparation that is marked by prayer. While Lent is characterized by fasting and a spirit of penitence, Advent’s prayers are prayers of humble devotion and commitment, prayers of submission, prayers for deliverance, prayers from those walking in darkness who are awaiting and anticipating a great light (Isaiah 9). 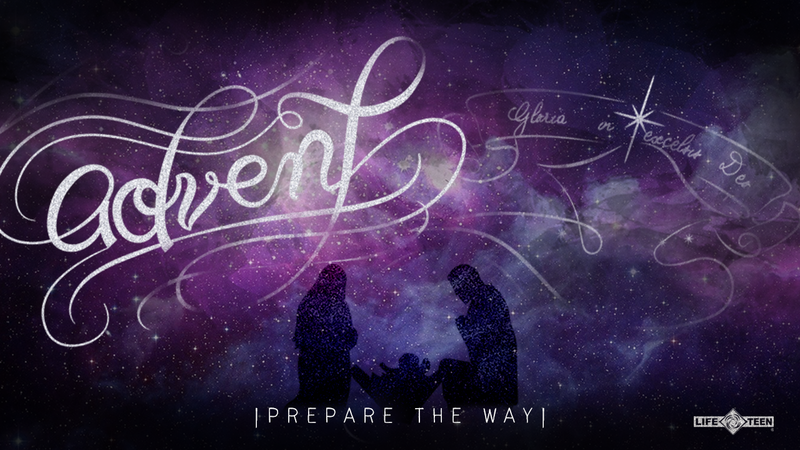 Historically, the primary color of Advent is Purple. This is the color of penitence and fasting as well as the color of royalty to welcome the Advent of the King. The purple of Advent is also the color of suffering used during Lent and Holy Week. This points to an important connection between Jesus’ birth and death. The nativity, the Incarnation, cannot be separated from the crucifixion. The purpose of Jesus’ coming into the world, of the “Word made flesh” and dwelling among us, is to reveal God and His grace to the world through Jesus’ life and teaching, but also through his suffering, death, and resurrection. To reflect this emphasis, originally Advent was a time of penitence and fasting, much as the Season of Lent, and so shared the color of Lent. In the four weeks of Advent ,the third Sunday came to be a time of rejoicing that the fasting was almost over (in some traditions it is called Gaudete Sunday, from the Latin word for “rejoice”). The shift from the purple of the Season to pink or rose for the third Sunday reflected this lessening emphasis on penitence as attention turned more to celebration of the season. In recent times, however, Advent has undergone a shift in emphasis, reflected in a change of colors used in many churches. The penitential aspect of the Season has been almost totally replaced by an emphasis on hope and anticipation. Many churches now use blue to distinguish the Season of Advent from Lent. Royal Blue is sometimes used as a symbol of royalty. Some churches use Bright Blue to symbolize the night sky, the anticipation of the impending announcement of the King’s coming, or to symbolize the waters of Genesis 1, the beginning of a new creation. Some churches, including some Catholic churches, use bluish violet to preserve the traditional use of purple while providing a visual distinction between the purple or red violet of Lent. The Advent wreath is a popular symbol of the beginning of the Church year in many churches. It is a circular evergreen wreath with five candles, four around the wreath and one in the center. The circle of the wreath itself reminds us of God, His eternal being and endless mercy, which has no beginning or end. The green of the wreath speaks of the hope that we have in God, the hope of newness, of renewal, of eternal life. The four outer candles represent the period of waiting during the four Sundays of Advent, which themselves symbolize the four centuries of waiting between the prophet Malachi and the birth of Christ. The center candle is white and is called the Christ Candle. It is traditionally lighted on Christmas Eve or Christmas Day. The central location of the Christ Candle reminds us that the incarnation is the heart of the season, giving light to the world. The light of the candles becomes an important symbol of the season. The light reminds us that Jesus is the light of the world that comes into the darkness of our lives to bring newness, life, and hope. It also reminds us that we are called to be a light to the world as we reflect the light of God’s grace to others (Isa 42:6). The progression in the lighting of the candles symbolizes the various aspects of our waiting experience. As the candles are lighted over the four week period, it also symbolizes the darkness of fear and hopelessness receding and the shadows of sin falling away as more and more light is shed into the world. The flame of each new candle reminds the worshippers that something is happening, and that more is yet to come. Finally, the light that has come into the world is plainly visible as the Christ candle is lighted at Christmas, and worshippers rejoice over the fact that the promise of long ago has been realized. As we enter this holy time of the year, we ask you to join with us in preparing for the coming of the Christ with joy, with anticipation, with prayer, and with love for all mankind. Amen. We wish you a blessed and holy Advent.